It’s funny sometimes how things play out. We were first exposed to Raphael Lunetta’s skills as a chef when Karen and I attended the Buick Discovery Tour at the Four Seasons Hotels in Westlake Village over five years ago. At the time Chef Lunetta was helming his restaurant JiRaffe in Santa Monica. After meeting him at the Westlake Village event and trying his food, we vowed to make it in to his restaurant but sadly never did. Ultimately we heard that he had closed it after a very long run. Then in 2017, we got word that he had opened Lunetta All Day in Santa Monica [in the space formerly occupied by Josie’s]. We had still not made it in to check it out when we received the invitation to the media tasting to introduce Lunetta Dining and The Moon Bar. While Lunetta All Day is a fast-casual restaurant serving breakfast, lunch and dinner [yes, all day], right next door Lunetta Dining and The Moon Bar [together known as Lunetta At Night] hit all the right notes of “elevated cuisine”, “handcrafted cocktails”, “local ingredients” and “farm to table”. These are not just buzzwords here; that is evident. At the media tasting, we got to sample a number of tasty treats, including beef carpaccio, avocado gazpacho, wood-grilled maitake, crab cakes, loup de mer and rack of lamb. Sample cocktails were served as well, although we focused on the wine. 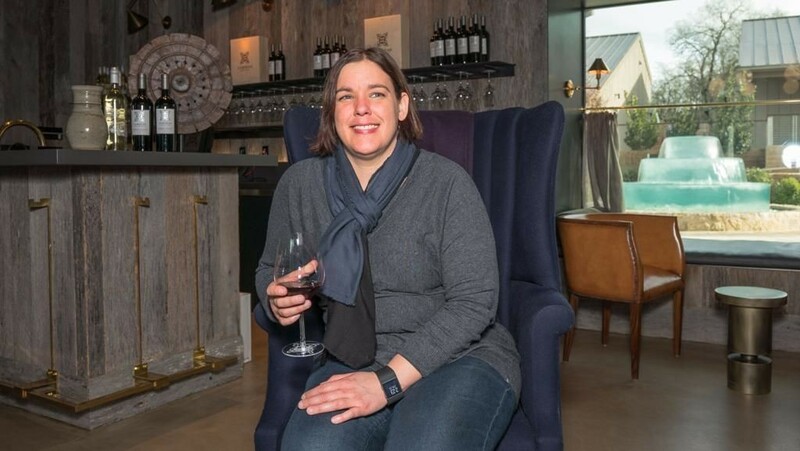 Sommelier and Beverage Director Kristine Bocchino has put together a great wine list from which we got to try the Picpoul from Forlorn Hope [Calaveras County], the Mourvedre Rose from Liquid Farm [Happy Canyon], the Brut Sparkling Chardonnay from Ferrari [Trentino. Italy] as well as the Cabernet Sauvignon, Merlot and Syrah blend from Perinet [Priorat, Spain]. But these just scratch the surface of this list that has a lot of gems on it at a variety of price points. The media event exposed us to an amazing array of food and libations as well as to Lunetta’s great staff, but of course it was nothing like what a diner will experience upon going there. Karen and I enjoyed the food soooo much that we followed up with a dinner – Saturday nights are especially great for getting out of the Santa Clarita Valley and seeing what the rest of the LA area has to offer. We shared the grilled nectarines [with manchego and prosciutto] and the wood-grilled Spanish octopus. Karen ordered the New Zealand John Dory. I couldn’t pass up the rack of lamb special. Preparation and service were superb. This was one of the best meals I’ve had in a long time. Everything was delicious. 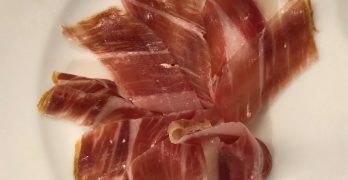 Hard to pick highlights but here are a few: The nectarines and prosciutto were both generous portions and neither ingredient overshadowed the other. And the octopus – I consider myself somewhat of an octopus aficionado and this was possibly the best I have ever had; extremely tender but not mushy at all, great flavor without being overtly charred. The rack was amazing, again one of the best representations that I have had of that classic as well. The open kitchen is a nice touch. Not obtrusive but there if you wanted to watch Chef Lunetta and his team in action, or even better – snag a seat at the Chef’s Counter. Somehow, the chef managed to spend time in the dining room as well, making his guests feel welcome. This place is definitely in our rotation; it should be in yours as well. Maybe if you spent a week in Paso, you’d be able to visit all of these. 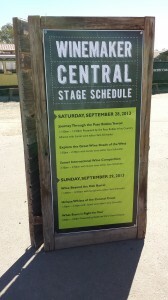 Fortunately, the Paso Robles Wine Country Alliance has a traveling roadshow. And admittedly, I did have another motive. 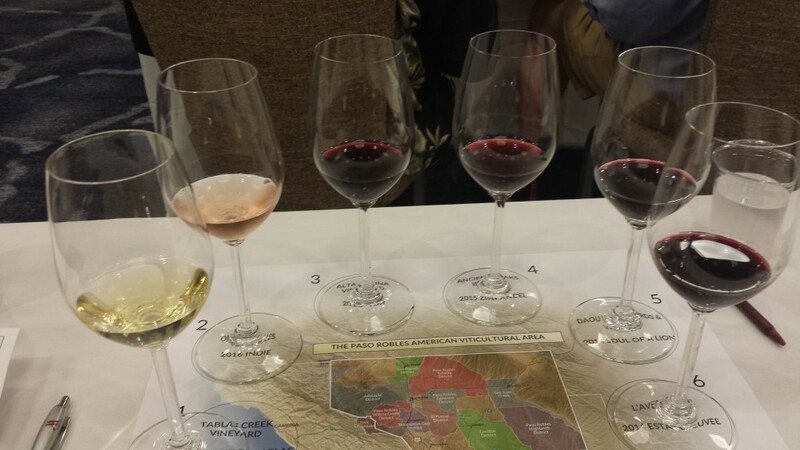 Prior to the start of the trade and media portion of the tasting, we were invited to attend a seminar on Paso Robles wine presented by Peter Neptune, MS. For me, this was enough to justify the schlep to Newport Beach even without the grand tasting afterwards. Master Sommelier Peter Neptune is a world renowned wine expert and educator. I’ve often wanted to attend one of his seminars but never had the chance. I was not going to pass up this opportunity. We tasted through six wines from wineries that are representative of Paso Robles Wine Country today. Mr. Neptune offered his thoughts on these wines, as well as how Paso has developed over the last couple of decades. We first tasted the 2014 Espirt de Tablas Blanc from Tablas Creek Vineyard. A blend of Roussanne, Grenache Blanc and Picpoul Blanc, PN said that that this is one of his favorite whites from Paso Robles. Then, we moved on to the 2016 Indie Rose of Tempranillo from ONX. PN referred to the wine’s “sunset” color and that it reminded him of a “creamsicle” [in a good way]. Time for the reds, so we started with the 2013 Grenache, Mourvedre and Syrah blend from Alta Colina, which PN referred to as a “versatile” wine. 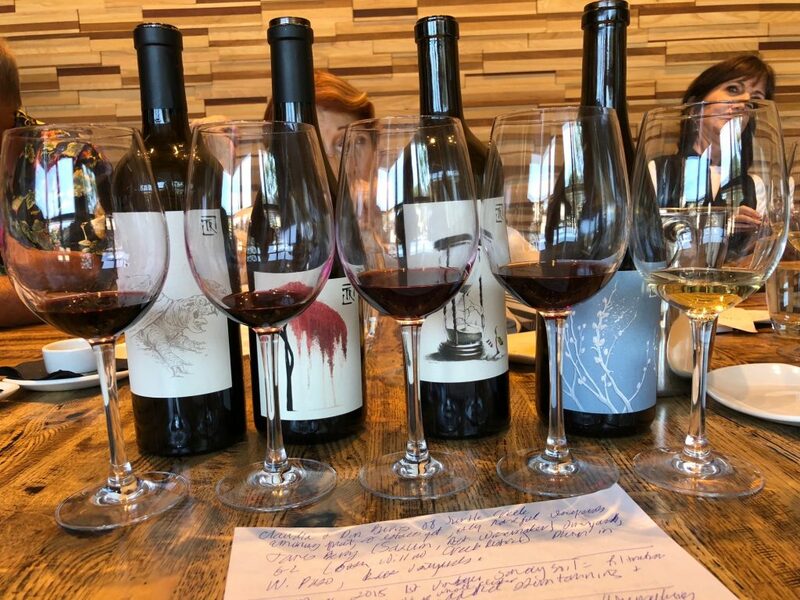 A Paso Robles tasting wouldn’t be complete without a Zinfandel in the mix, so we tasted the 2015 Zinfandel from Ancient Peaks, described with the highly technical word of “yummy” by PN. Then we had the opportunity to taste two of Paso’s super-premium wines – the 2014 Soul of a Lion from Daou and the 2014 Estate Cuvee from L’Aventure. The Daou was a blend of Cabernet Sauvignon, Cabernet Franc and Petit Verdot, which PN referred to as “gorgeous” and the L’Aventure blend of Cabernet Sauvignon, Syrah and Petit Verdot was noted by PN to have “tremendous power and concentration”. We also discussed the 11 Sub-AVAs within the Paso Robles AVA [American Viticultural Area] and how wineries were labeling their bottles with their specific AVA along with the trend toward estate wines and organic and biodynamic farming. Peter Neptune’s passion for wine really showed up in the class. His speaking style made a fun seminar even better. After the seminar we stayed around awhile to taste some of the wines being poured at the Grand Tasting before heading back up to the Santa Clarita Valley. Next week, I’ll let you know our favorites. We brought some family members with us on our last trip to Paso Robles. This trip wasn’t about breaking new ground or seeking out new discoveries. Instead, we purposely visited some old favorites to show them [and remind us] what makes Paso such a special place for my wife Karen and me. So much of it is about the great people we know there and diversity and quality of the wines. No, it not all about that Zin or any other one grape. 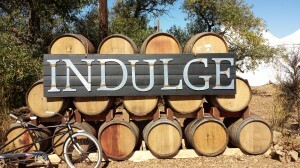 Truly, Paso Robles can be many different things to different people. And we could just as easily have visited five other of our favorite places. This was our Paso, this time. Hitting town at the start of Labor Day weekend, the overriding message we got from everyone we talked to was that “harvest is EARLY [which we knew] and in many cases happening very quickly, yields are low [which sounds bad] but quality is OUTSTANDING!” So, when you read these articles, bear in mind that maybe the best is yet to come. I can’t think of a better way to start a Paso Robles visit [or end one or be in the middle of one] than a stop at Denner Vineyards. Back in the days when I was prejudiced against beautifully architected wineries [the money should go in the wine, not the tasting room, right? ], some good friends of ours at the time took us to Denner to explode that belief. Not only are the grounds amazing and the winery building truly a work of art, but the wines [primarily Rhone-based blends] are delicious and really showcase what I believe Paso does best. We’ve been club members ever since. 2014 Rose – this year a blend of 50% Grenache, 40% Cinsault and 10% Counoise, it was light and tasty and a perfect way to get our day started. 2014 Theresa – a refreshing white blend of 40% Rousanne, 20% Picpoul, 15% Marsanne, 15% Grenache Blanc and 10% Vermentino; the nice lingering finish from the Rousanne combined perfectly with a zestiness that I can only attribute to that touch of Vermentino. 2013 Grenache – with 4% Syrah and 4% Mourvedre. The raspberry notes leapt out of the glass on this one. Great example of this varietal and why I am turning into a huge Grenache fan. 2013 Ditch Digger – the blend changes every year, this time it is 50% Grenache, 25% Mourvedre, 15% Syrah, 5% Cinsaut and 5% Counoise. More of that great Grenache. 2013 must have been a great year for that varietal, at least here at Denner. In this case, the Grenache is clearly showcased but the other grapes are evident as well. Darker and richer than the Grenache mentioned above. 2013 Dirt Worshipper – 99% Syrah, 1% Rousanne. This is the kind of Syrah that reminds me how much I love this grape. Where Grenache is about red fruit, Syrah is definitely black fruit. Big, bold and delicious. We also had an opportunity to chat a little with Denner General Manager Carol Rounsaville and discuss the history of the winery. Ron Denner purchased the property in 1997 and planted it in 1998. The winery’s first release was the 2002 Syrah; blends soon followed. Famed Saxum winemaker Justin Smith consulted early on, with Denner’s first official winemaker being Ron’s son Brian. Brian has since moved on to his own winery project in Oregon. 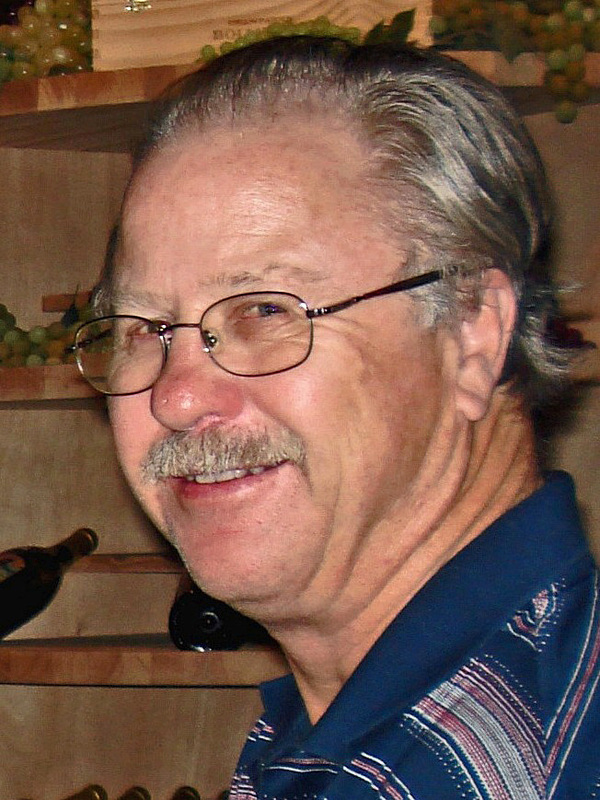 Current winemaker Anthony Yount worked as assistant winemaker at Denner as well as at Villa Creek. He also has his own project. [You can read more about Anthony in Jon Bonne’s book The New California Wine.] 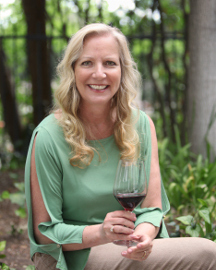 Carol said that owner Ron Denner gives the winemaker full rein over the winemaking process, much as he did with San Luis Obispo architect John Mitchell who designed not only the tasting room but the entire winery. Carol also told us that production is typically around 7,000 to 8,000 cases, although it will be lower with the current harvest. The common refrain on this trip was – quality is very high, but yields are LOW. That being said, here is some good news – for a while the Denner wine club [known as the Comus club] was closed to new members. But, it is currently open. So, now is your chance! To those that know me it is no secret that I am in love with Paso Robles. Yes, I still collect wines from France and Italy but Paso is growing to become a second Napa Valley in my opinion. This area has a wide variety of wines to select from over 300 vineyards producing many different varietals. This includes both “Old World” and “New World” styles as single varietals and blends. Even hard to find varietals such as Tannat, Picpoul, Carignan, etc. Thanks to the dedication of the Rhone Rangers we see a lot of diversity in California grown Rhone wine varietals. Recently, there has been a new push in the Paso region where Cabernet Sauvignon is being promoted. This push was kicked off by Daniel Daou of Daou Vineyards. 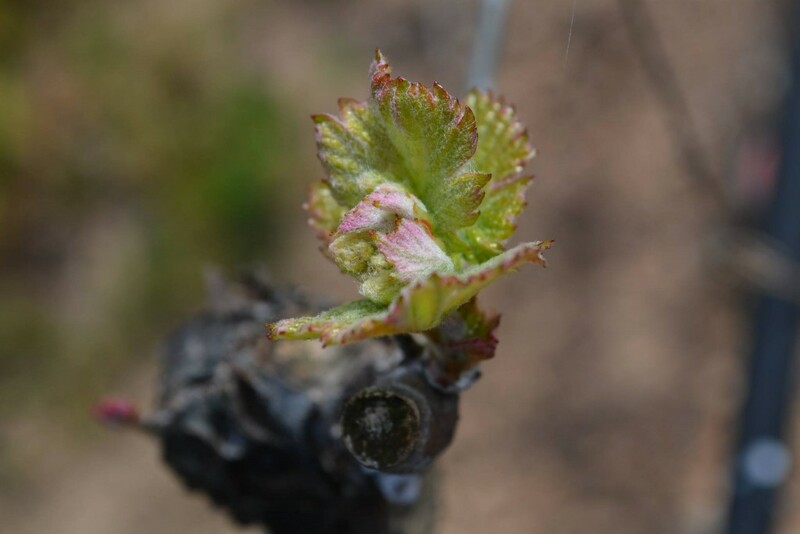 Since the establishment of the Daou Vineyards the Daou brothers, George and Daniel, have given dedication to this grape varietal resulting in the newly formed Cab Collective. Daniel Daou discovered that there were a few Cabernet Sauvignon wines being produced in Paso that were not gaining the notoriety that they should. The Cab Collective was organized and a small group of Cabernet Sauvignon producers are working hard to show the quality of this varietal from this region. It is this variety and availability that led to an exciting adventure for my wife and friends of mine in the Paso Robles region. A fellow colleague/friend from work, Jordan Siperstein, and his wife Natasha asked if I would show them around Paso. My goal was to provide them with the best experience possible in one day. Being young and having such an interest in wines is priceless. I even see this in my son and become envious that I was not educated at an earlier age. The tasting at J Dusi provided a great introduction to typical California varietals as well as some unique old world varietals such as Carignan, Sangiovese and Tempranillo. Add to this the beautiful fortified Zinfandel Port accompanied with some dark chocolate and you are set. All of the woman at our tasting loved this wine. Though Janelle was not pouring her Grappa she was kind enough to give Jordan and Natasha a small taste. Though it is a distilled liquor it has very unique characteristics of the Zinfandel skin and seed ruminants that are used to create this beauty. It is quite different. For our second stop we visited Tablas Creek Winery where we met with Cindy Shear. This winery provided an introduction to wines that are made in California but showcase the vines and techniques from their sister winery Chateau de Beaucastel in France. The winery in France only produces Chateauneuf-Du-Pape and Cotes-Du-Rhone doing both red and white styles of each. From the opening of Tablas Creek until 2010 their signature wine carried the name Esprit de Beaucastel showing a link between the French and American wineries. In 2010, Tablas Creek changed the name of this wine to Esprit de Tablas. 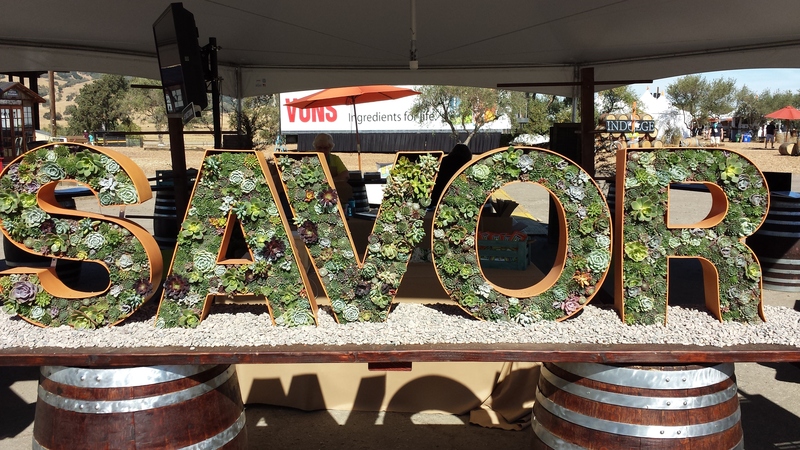 This concludes the first half of our day in Paso Robles…stay tuned for the conclusion which includes Daou Vineyards and Denner Vineyards. Sunset SAVOR the Central Coast is definitely on that list. 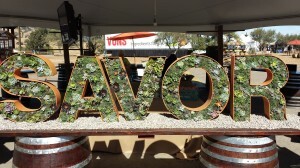 Held annually, with the Main Event at the Santa Margarita Ranch just outside of San Luis Obispo, the event brings together 50 Central Coast wineries ranging from Santa Barbara County to the South to Monterey County to the North, along with a host of food purveyors and lifestyle vendors. In addition, there are multiple chef and winemaker seminars so you can really learn about the wineries and food of the Central Coast, while enjoying the best of what the Central Coast has to offer. This year’s event took place the last weekend of September. It actually started Thursday morning, September 26th, with special events taking place off the Main Event’s grounds throughout the weekend. The Main Event took place Saturday, September 28th and September 29th. One-day tickets cost $85, with a two-day pass going for $150. I highly recommend going for the two-day pass. It makes for a much more leisurely weekend, and there is no way that you could hope to spend a weekend tasting even a fraction of the wine and food offered if you tried to do it on your own, so the $150 is quite a bargain. The seminars taking place during the main event are at an additional charge of $25, but they are well worth it. What Stem is Right for You? While you may have some of the above, I doubt if you’ve tried them all. Lots of fun and a refreshing break as well! Seminars were well-attended – some sold out. I think the first to sell out were Michael Voltaggio’s seminars, and not surprisingly. Michael is well known as a great chef, and if you are familiar with the television show Top Chef, you know that a few years ago he beat out his brother Bryan, as well as Kevin Gillespie, in the finale of what I still consider to be the best season of that show so far. We had the pleasure of attending two media panels that involved Michael Voltaggio. 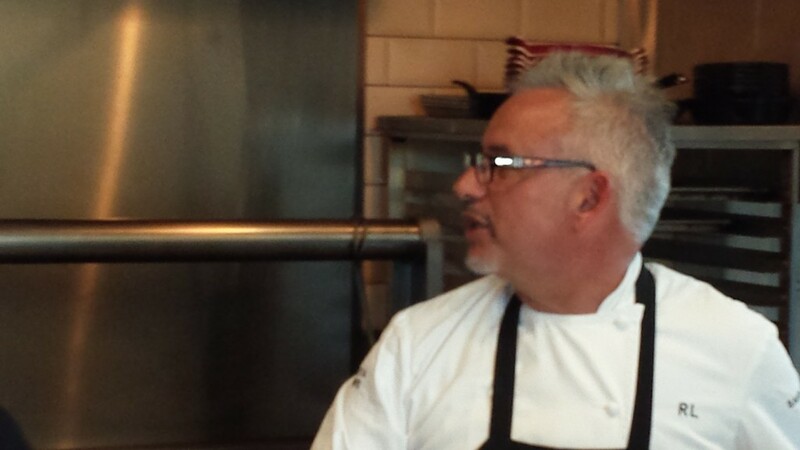 The first one included chef Nathan Lyon and was moderated by Peggy Northrop, Sunset Editor-in-Chief. The second included Marcela Valladolid [from the Food Network] and Jeff Anderson (Vons Executive Chef) – this session was moderated by Margo True, Sunset Food Editor. The overriding message that I got from the panels was that the food was the message. Michael Voltaggio said that the move was away from “hyper-food”, manipulating the food for presentation purposes, and letting the food speak for itself. The above wineries, along with a lot more, were in the area labeled the Marketplace. There was also another section, called the Central Coast Pavilion, which included not only additional food items to sample, but wineries that had recently won awards at the Sunset International Wine Competition. Almond Hill Vineyard, a very small producer with an absolutely delicious Syrah and Cardella Winery, based in the San Joaquin Valley, with a terrific Syrah and Barbera. But, as I said, most of the wine was out in the Marketplace. While I already mentioned my favorites, there are a few things that really stood out for me. First of all, it was great to connect with Mike Sinor of Ancient Peaks. I hadn’t seen him in quite some time. Second, I finally met the owners of Castoro Cellars, Niels and Bimmer Udsen. Castoro was the first winery we ever visited in Paso Robles twenty years ago, but we had never met the owners of this pioneering winery that doesn’t get nearly enough attention these days. And, third, write this down: Rob Murray Vineyards! Awesome wines, with admittedly really cool labels. I especially loved their amor fati Syrah and Grenache. 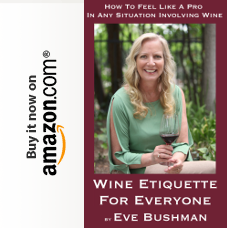 I always consider an event a success when I can find a new winery that knocks me out, and this one did – and they are available at Whole Foods. All in all, an outstanding event. Get on their mailing list so you don’t miss out next year.